What is the Best Material for Acoustic Guitar Nuts? Acoustic guitar nuts (and no I don’t mean people who are nuts for acoustic guitars!) are an important little part of a guitar. To the non guitarists eye this would be almost unnoticeable but without it the guitar simply could not function as an instrument. The first part of this article will look at the important functions of the nut and the second part will look at which material is best suited for the job. The nut has a few very important functions. The nut has the very important job of making sure that the strings remain spaced across the fret board as they should be. Without a nut the strings would not line up properly and make playing the guitar very difficult if not impossible. I can’t say I’ve ever tried to string a guitar without a nut but I don’t recommend it! The nuts second function is controlling how high above the fret board the strings are (the guitar’s action). If the strings are too high then the guitar will be difficult and hard work to play and it could affect the intonation. But too low and you risk getting the dreaded fret buzz! And if you had no nut at all? Then your guitar would be unplayable as the strings would lie against the fretboard, unable to vibrate. Now we start to get into the importance of the material of the nut. The material of the nut on an acoustic guitar will affect the overall tonality of the guitar. The most notable effect it will have on tonality is when playing the open strings. The material of the nut will affect sustain – either in a good way or a bad way. Again this will be most notable when playing open strings. O.k. now let’s see how each common nut material meets the specifications of a good nut. Plastic: Unfortunately a lot of guitars come with cheap plastic nuts. Plastic nuts fail almost all of the specifications for a good nut material. The standard plastic nut will slowly grind away – which will cause your action to, without you wanting it to, lower itself – and it will do it unevenly. Eventually you will start to get fret buzz and you will need to replace the nut. If you get a guitar with a plastic nut I would suggest replacing it from the start. You’ll likely have to replace it at some stage anyway and if you replace it now with a better material you will also get the tonal advantages. Plastic doesn’t produce a nice tone and the sustain is typically woeful. 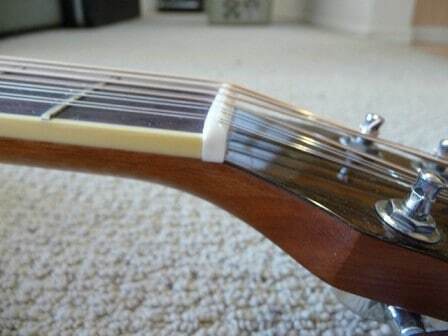 You could also start to get problems with keeping the guitar in tune with a cheap plastic nut. Flash Plastic: O.k. flash plastic is not the technical term but I guess it kind of describes the material in question here. This comes in a few different types – e.g. TUSQ, Nubone and Micarta. These ‘flash’ plastics attempt to imitate the tonal qualities of bone or ivory and at the same time attempt to be more consistent than their natural counterparts. Bone and Ivory can have hard and soft spots – whereas the synthesized versions are supposed to take away this inconsistency. Whether or not these materials beat the real thing is hotly debated. Some swear by bone and some swear by the synthesized versions. Personally I don’t notice a huge difference in sound but my ear may not be as attuned as some. 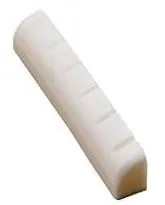 Bleached Bone: Bleaching bone for the purposes of making a nut is like white bread – it looks all clean and nice but it removes a lot of the benefits that were there in the first place. And that’s pretty much the only point of bleaching the bone – to make it look whiter. To be honest I actually prefer the look of natural bone over the bleached stuff so I don’t think it even has that advantage! Bleaching the bone takes away some of the desired characteristics of bone. It softens it – which affects both tone and life expectancy. It also reduces the bones self-lubricating traits. Natural Unbleached Bone: Apparently some luthiers (guitar makers) refuse to make their nuts and bridge saddles out of anything but bone. Bone helps to produce a great balanced tone on acoustic guitars with a great attack into the note and better sustain. As can be the case with other nuts, open notes don’t sound shrill or too loud. Bone is also naturally very hard and won’t wear down like plastic. 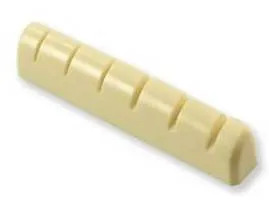 Bone is the traditional choice of material for acoustic guitar nuts. Fossil Ivory: Finally we come to fossil ivory. Some people prefer the tone of fossil ivory over bone – but again others swear by bone. Tone wise this really comes down to personal preference. Fossil Ivory can also look fantastic – like unbleached bone – if the aesthetics are important to you. It is worth noting here that I have included Fossil Ivory only here. Fossil Ivory is Ivory from animals that died millions of years ago naturally and has since been found. For this reason it is more expensive than bone, harder to source and more specialized. Non-fossil ivory is illegal in most countries and immoral, in my opinion. Do you really want endangered animals to have to die just for your tone? Especially when bone and fossil ivory will be just as good if not better. What’s Your Favorite Nut Material? Do you rate the nut material as being important? If so what nut material do you prefer? Feel free to leave a comment below. Any other questions and comments also very welcome. I enjoyed your articles on nuts, Saddles and bridges. Thank you. It has concern me to read reviews of Fender guitars in the $400 range that use plastic nuts and saddles. They do not even bother to call them synthetic bone. This seems like such a cheapskate shortcut. If I misunderstood or misjudged Fender products in this price range? Hello liked your article on guitar nuts, That has left me with a question, Has lexon which is a bullet resistant material or carbon fibre been used? How about guitar nuts made from deer antler? Would that make a desirable material for such a purpose?